SBS Model produces an impressive array of aftermarket detail sets for a variety of popular kits and subjects. Their online store is nicely laid out to show the variety of cockpits, propeller sets, ejection seats, and more that are available directly from their site. This release is an impressive enhancement to the Eduard 1/48 Dassault Mirage IIIC kit. 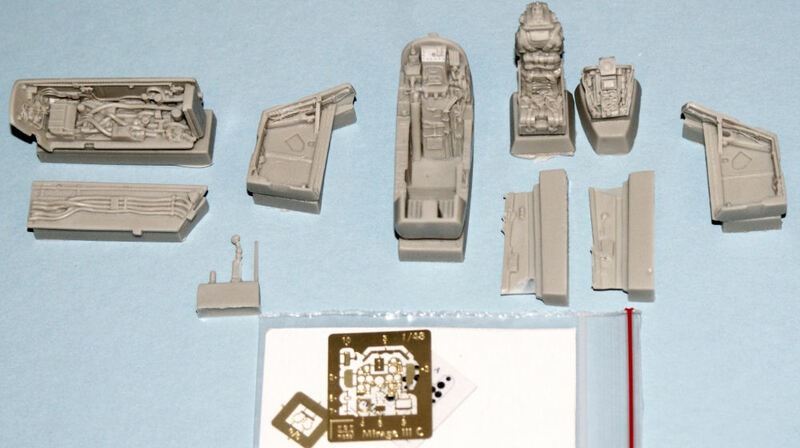 This set completely replaces the interior of the stock kit with new resin pit, resin and PE instrument panel, super-detailed ejection seat (w/standard and Israeli detail options), and a nice detailed coming/gunsight. While this set is billed as a cockpit set, you'll notice that this set also has very nicely cast resin nosewheel and main wheel wells to update the stock kit as well. 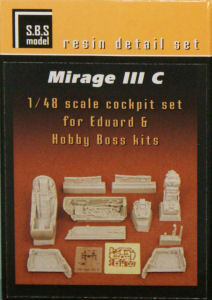 This set will work in any of the Eduard releases of their Mirage IIIC series and will also work with the HobbyBoss releases of the kit as well. You can obtain SBS Model's detail sets directly from the SBS Model website. My sincere thanks to SBS Model for this review sample!